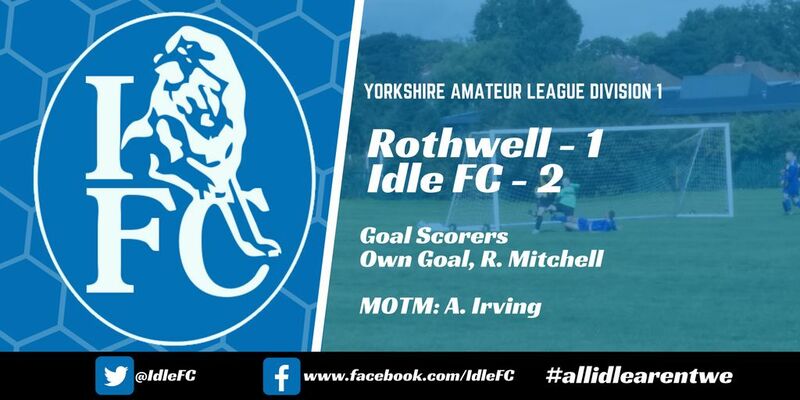 Match report: Rothwell 1 – 2 Idle FC. Determination, desire and DE-fence! Idle faced their toughest test of the league campaign so far this weekend as they travelled to league leaders, Rothwell in Division 1 of the Yorkshire Amateur League. Having played 5 more games the Idle, Rothwell were the pace setters and certainly a strong and physical side. However, Idle were certainly up for this game knowing that a victory would secure another vital 3 points in the quest for the Division 1 title. The visitors started much the better side which made a welcome change to the usual narrative. Idle used the wide and flat pitch to their advantage, playing long passes in behind the Rothwell defence and utilising the pace and guile of Adam Medley, Ryan Mitchell and Aaron Irving to put the Rothwell defence under pressure. However, Idle were on the front foot with Medley giving the Rothwell right-back a torrid time down the left flank. Irving also came close to opening the scoring on a number of occasions, including a header which the goalkeeper somehow managed to claw out of the far corner to prevent Idle taking the lead. The deadlock was finally broken from yet another Rothwell foul in midfield. Jack Strudwick took the resulting free-kick and whipped a wicked ball into the box. The keeper elected to punch the ball clear but succeeded only in finding the back of his own defender. The deflected ball looped over the keepers head only for the second, covering defender to swipe the ball into his own net in a desperate attempt to clear. 0-1. Rothwell weren’t to be underestimated going forward as the sun and wind played into the hands of the home side. Idle defended resolutely, breaking down most of the Rothwell attacks before they had a chance to get a shot in on goal. The only real chance came from a lofted pass to the Rothwell striker, who appeared to be in an offside position but with the referee’s whistle remaining silent, the attacker managed to spoon the ball wide of the post. Idle soon regained control of the game following that scare and doubled their lead late in the second-half. Some tenacious work from Ryan Mitchell saw the winger retrieve a loose ball down the left-wing with the Rothwell players assuming the ball was out of play. Mitchell continued his surging run from wide into the box and with no defenders near, finished calmly at the near post to make it 0-2. It’s safe to say the referee had little to no control of the game at this point with several obvious yellow cards and one certain red card going unpunished. However, Idle went into the half-time break 0-2 to the good. The second-half was a much more cagey affair with Rothwell pushing to get back in the game and Idle beginning to drop deeper and become more defensive to protect the lead. Despite Rothwell’s continued pressure, the Idle defence continued to hold strong with Luke Chandler and Lee Cookson forming a strong partnership in central defence. Rothwell did eventually manage to get the goal which would give them hope after a hopeful cross found the midfield number 5 free in the box. Some say Marcus Strudwick can still be heard shouting “Rosco, number 5’s yours!” to this day. The midfielder applied the clinical finish past Strudwick in the Idle goal and would certainly make it a nervous last 15 minutes for Idle. Despite conceding late in the game, Idle were not to be deterred and managed to mount some promising counter-attacks, several of which ended up with guilt-edged chances to extend the lead go begging. A free-kick was awarded to Idle on the edge of the Rothwell box and Jack Strudwick stepped up to take it. Young Strudwick hit an absolutely delightful free-kick with power and precision that struck the post/bar and bounced down over the line with the side netting rippling. However, despite the referee being stood on the edge of the 6-yard box, he decided not to award an obvious goal which allowed the Rothwell players to counter-attack whilst Idle were celebrating. Fortunately, that break away didn’t result in an equaliser for the home side. Idle’s strength and determination to win was enough to put the game to bed with the final score at 1-2, thus securing another 3 points against tough opposition. 8 games to go lads!